It's just another day at the office for California park ranger Jenna Beck and her Husky, Nikko-- until the distress call comes through from a remote military research station. Although she arrives too late, Jenna and Nikko are about to become an unofficial part of the Sigma Force team. When emergency personnel arrive at the station, everyone inside is already dead, but death doesn't stop there. Everything in and around the research facility has been exterminated: every animal, plant, insect, bacteria.... Everything down to a depth of two feet is gone, and the destruction is spreading. It is now up to Sigma Force to find out why and how it can be stopped. Their quest takes them to Antarctica, and they're running out of time. 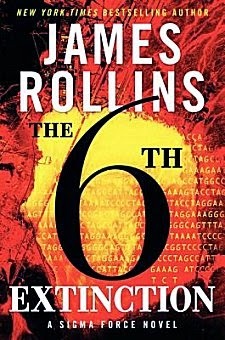 Everything James Rollins is famous for is here in The 6th Extinction: fascinating history, cutting edge science and technology, and an adrenaline-soaked pace. I loved the ties to history: which countries had been in Antarctica and why, Darwin visiting while aboard the HMS Beagle, an ancient Antarctica not buried under snow and ice. The science was fascinating as well, especially the look into synthetic biology. As always, Rollins' notes at the end should be required reading for anyone who wants to know how much of the book is factual. As much as I loved the research behind the story, the two "worlds" Rollins created (one of which is in Antarctica) just didn't grab me. In fact I was reminded of two blockbuster movies. When Kowalski says, "Something tells me we're gonna need bigger guns," I immediately thought of Roy Scheider's famous line in "Jaws," and all the talk of synthetic biology and what could be created? I heard Jeff Goldblum in "Jurassic Park" telling Richard Attenborough, "Your scientists were so preoccupied with whether or not they could, they didn't stop to think if they should." Sometimes it's a good thing to be reminded of other books and movies, but this time, remembering movie quotes just made this story feel stale. Although I did tire of the non-stop action that skipped from group to group in scenarios I just couldn't believe in, I have to admit that I perked up whenever Jenna Beck and her dog Nikko walked on stage. Those two are a winning combination that I actually would look forward to seeing again. All in all however, compared with other Sigma Force adventures, The 6th Extinction doesn't quite hit the target. Cathy - Hmmm....Glad you found some things to like in this. To be perfectly honest though, I may wait on it. I do tire of non-stop action/adrenaline, and even more so when I have to leave my disbelief too far behind. Still, as I say, I'm glad you found things to like. I've OD'd on them myself through a poorly planned reading schedule.